What is CeeLab all about? At CeeLab we are all about bringing Cloud Communication Services to business. Our passion is that with efficient Cloud communication technologies businesses can get more done, in less time and with less money, i..e business is faster and more efficient. 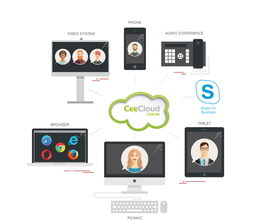 CeeLab enables our clients with the right technology and services to have online, high quality, secure and efficient meeting in Cloud based Virtual Meeting Rooms. We see Cloud based virtual meeting rooms when coupled with professional video conferencing equipment as being the most efficient way to meet, and is both a local and global solution. Click the button below to see our solution to increasing efficiency.